*Rainstar Capital Group makes no claim as to the accuracy of the terms of these lender programs, as the direct lenders and fund managers that work with Rainstar Capital Group at times change their underwriting criteria and their loan matrices. To the best of it's ability, Rainstar Capital Group updates these lender profiles based on information provided by the lenders. By applying for any program, the client acknowledges that the programs, interest rates, LTV's, etc. are subject to change based the lender's underwriting criteria. Lender Description: Lines of credit from 1k to 100k. Director must submit through our portal and your team leader will set you up on it. Other Information: No paperwork or personal credit check to get started. Lender Description: A Fintech lender providing the fastest, most convenient way for small businesses to get funding via Line of Credit and AR Financing. Other Information: Draw funds anytime in minutes online. Repay in fixed installments over 6 or 12 months. Lender Description: This Fintech lender is a credit solutions provider for clients seeking a term loan. Other Information: Lender is a Leading online direct lender that works solely with partners to offer their small business clients the best credit financing solutions for their businesses. Lender Description: Term Loan product for small business loans that can fund in four hours with a monthly repayment plan. Other Information: Lender offers business owners simple interest term loans that have no prepayment penalty. Lender Description: Advisory group providing clients Business and Personal Credit Cards. Other Information: Great solution for startups or folks with not strong revenue. Program leverages the client’s personal credit score. Lender Description: Business term loan that likes to have additional collateral in the form of real estate. Other Information: Lender provides a term loan product that is perfect for growing businesses o clients seeking to refinance out of Merchant Cash Advances. 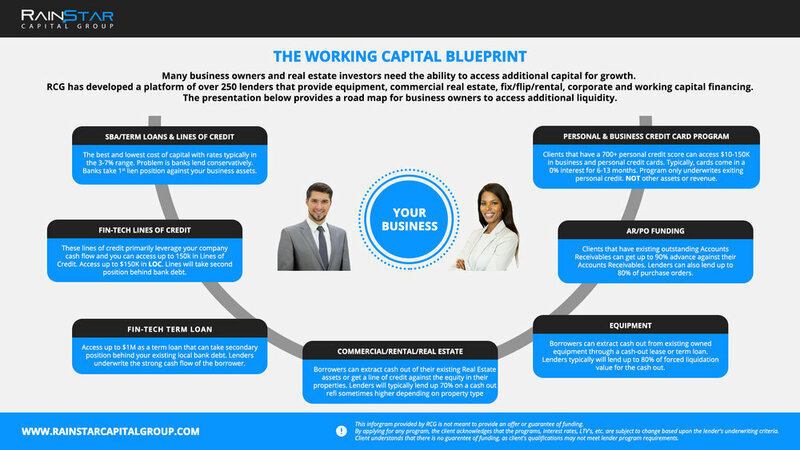 Lender Description: Small business lender that takes secondary collateral in the form of real estate up to 100% CLTV. Other Information: Lender that provides working capital while taking secondary collateral of real estate up to 100% CLTV. Lender Description: Term loan lender. Unique program where they require the borrower to have family and friends contribute part of the loan ensuring payback. Lender Description: Lenders is redefining SBA lending through its advanced technology platform. Other Information: Lender offers the lowest monthly payments, great rates, and hassle free application. Their passion is helping your business thrive. Lender Description: Hard money lender for working term loans collateralized by equipment, trucks or residential/commercial real estate. Other Information: Lender is very creative to get clients capital as long as collateral value is there. Creative & Flexible Structures Include: Equipment Acquisitions, Working Capital, Sale-Leasebacks, Debt and/or Equipment Refinances, Bridge Financing & more. Lender Description: Specializes in the Restaurant Industry and their Loans have a factor rate. Other Information: Lender requires a weekly or monthly repayment model. Lender Description: Built on the pillars of transparency, honesty, and doing what’s right for small business. Other Information: Lender is working for small businesses every day, providing responsible working capital solutions tailored specifically for your business. Lender Description: Community lender for clients seeking a term loan. Other Information: Lender works with a diverse group of business owners, each with unique needs and circumstances, and are able to provide loans when traditional sources cannot. Lender Description: Lender is a new funder in the alternative business funding space. Loan Products: An MCA A-D paper funder, that specializes in high risk paper. Fund up to 1mm. Typical term is between 3-6 months at a 1.45 factor rate. Typically make offers within 2-4 hours maximum of receiving a submission. Typically fund within 2 hours of receiving signed contracts. Other Information: Lender prides themselves on being a quick and reliable funding source for all of our clients and partners.